This month, we’ve been looking at ways to keep your cats skin in optimum health, as well the best types of food for maintaining skin health. Keeping your cat’s skin in good condition is essential for your cat’s overall health, which is why we present you with our quick top nine brushing facts to help you easily remember the most useful facts for when you brush your cat. The chances of your cat shedding and swallowing hair is likely to be reduced through brushing them regularly – how regularly varies from breed to breed. Being patient and brushing gently will ease them into being brushed. Some cats enjoy their ears or chins being rubbed, so brushing there can instantly warm them into the process (note that most cats won’t enjoy brushing their soft underbelly). To get your cat used to the idea of being brushed, you can simulate the sensation of brushing with your hand and a gentler item, such as a wash cloth, before gradually using your brush to get the job done. When you brush your cat, natural oils that help maintain skin and hair health are distributed throughout their coat. Frequent brushing keeps your cat’s hair free of tangles and grass, twigs or anything that can stuck to them outside – this is essential in lowering the chances of matting, infections and abscesses. Giving your cat a treat immediately after their brushing session can help your cat associate the brushing experience with being rewarded, and therefore reinforce positive behaviour. Brushing isn’t just for keeping your cat clean. Brushing can actually help owners build rapports with their cats because when they’re familiar with being held and the brushing process itself, they will enjoy the sensation of being brushed – it releases the pleasure chemicals called “endorphins”. If you want to check for fleas or scabs, brushing is a great way of checking in a way that won’t alarm your cat – the familiarity of being brushed should keep them calm. 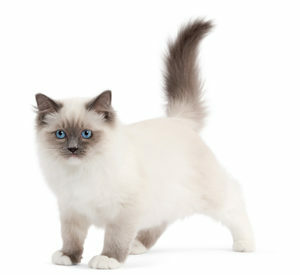 A cat is more likely to be content and instantly familiar with grooming, including brushing, if they were handled and gently brushed as a young age kitten. Choosing a quiet, peaceful moment in your cat’s day to brush them is best. They will respond far better if they are relaxed, and the process will be much easier than when they’re excited from playtime or hungry for food. If you found these tips useful, be sure to bookmark this page and come back to if you ever forget any of these nine facts. If you have any questions regarding your cat, it’s always best practice to speak with your vet and disclose any queries you may have with them.